Some conversations are like looking into a mirror. I am quiet, eyes open, gazing at the other, listening to their story. Their frustrations. Their hopes. Their fears. 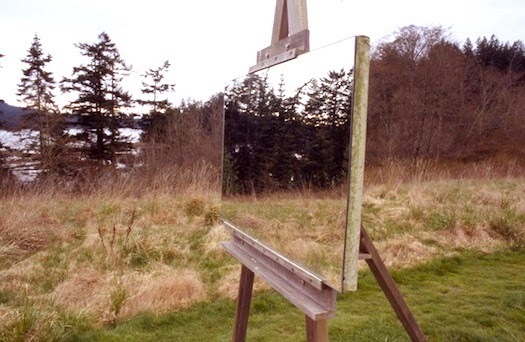 The mirror has no edges or frame. It is only a means for reflection. I stare into the other person's eyes and I see myself. A blurred image in their retinas and souls, and I am momentarily out of sync with their story as my own story/frustrations/hopes/fears shine through. Like walking through busy streets and suddenly coming upon your reflection in the mirror of a pond, a puddle, a window, I am taken aback at my own image. Then I snap back to being present. I offer words of advice and consolation, acting as a sounding board for reflection. I am a mirror for the other, just as they are a mirror for me. The advice I give this person who is hurting, scared, alone, exhausted--it is the same advice I need for myself. Get some rest. Be disciplined with your time. Trust in the Lord. Remember God's grace. You're not alone. You're always loved. I need these truths for myself. As I speak them out for the other, I am speaking them to my own heart. Yet when I share these same truths with only myself, as in a literal mirror, it becomes merely a self-improvement pep talk. Sharing my own positive thoughts aloud with my reflection rings false and insecure. I stand in my bathroom and peer at my reflection, and the narcissism and anxiety begins to brim over. Any words I direct from myself to myself hit the glass but cannot pierce my heart with any sense of conviction. It is only when I share these truths outside of myself, speaking the truth in love to others, that I begin to hear the Spirit's whisper as He reflects the life-giving truth into my soul. Often these human mirrors will speak aloud in response to me, offering their own words of wisdom and encouragement out of friendship and unity. Perhaps this is indicative of our nature as image-bearers, reflecting the imago dei with others in community and connection. Perhaps this is why Paul's strategy in Ephesians 4 for building a mature church is simply this: speak the truth in love with one another. The words spoken from myself to myself are never as sure and true as the same words spoken to me from another whom I love and trust. I need these image-bearing mirrors to reflect grace and truth back into my life. I want to be such a mirror for others.